I usually try to fill up my blog with insight and analysis that would satisfy anybody from an average fan to an abusive sportsaholic. I aim to stay as objective as possible when talking about my favorite teams to give singleminded fans a broader perspective. I try to garner everyone's attention when talking specific topics by relating them to other happenings in the world, rather it be sports related or not, so that everybody can find atleast a little enjoyment from them. I write to you all today from a very ignorant (ig-nant) point of view offering zero insight on the game or logic towards who will emerge victorious (I know who's winning tonight), because that's not what tonight is about. Tonight is about passion. And emotion. And about protecting this house. And the Ultimate Tailgating Experience. It's about a bratwurst in one hand and a lukewarm PBR tallboy in the other. It's about trying to sneak in a half pint of Old Grand Dad Whiskey (Bad Santa's choice) to avoid paying 10 bucks for a brew dog. It's about razzing any Chargers fan you see, then laughing it off to avoid being one of "those guys," but secretly wishing harm on them upon entering the stadium (only to last for the 3 1/2 hours). It's about yelling CHIEFS so loud at the end of the national anthem, that constitutionalists are offended all over the country. It's about developing that invincible sense of euphoria that there's no way the Chiefs can lose with so much emotion swarming the stadium (usually gained right before kickoff). It's about screaming all game loud, and not having a voice the next day (the entire city should be 3 octaves quieter come Tuesday). It's about the stadium being loud enough that the TV commentators break out the device to measure the decibel levels of the crowd. 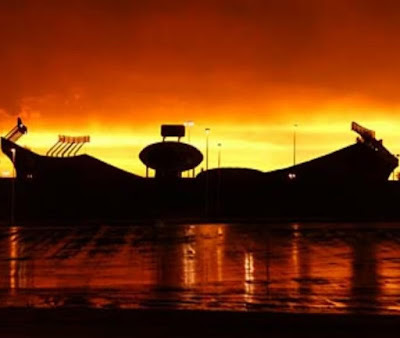 It's about showing anyone that has forgotten, around the city or the country, what Arrowhead Stadium is, what it was, and what it shall be (T9). That being the best gameday experience/homefield advantage in the NFL. There are some of us out there that truly live and die with Kansas City Chiefs football. Literally, the Chiefs' well-being affects their day-to-day happiness in life. Think about that. These are your peers. They've entered a dark, dark place these last few years, and they need to be awakened. We have our chance to do just that, and we get it on Monday Night Freakin' Football?!? Look people, the nation has forgotten what Arrowhead Stadium used to be about. Tonight is our chance to change perceptions. We need our aura back. And each and every one of you attending tonight can quite literally have an effect on the outcome of the game. To all readers, you hold not only a personal responsibility to be ALAP (as loud as possible), but to make sure everyone around you is being ALAP. I know for sure, that a certain five gents, occupying the very top row (section 323) will be giving everything they've got to ensure a Chiefs victory. Hopefully that spreads all the way down to the front row. I want this to be the loudest Chiefs game in history. When I'm watching the game on a large, HD TV, I will be able to immediately pinpoint that wife-beater tanned, beard braided, PBR touting hoboken streaker flyin across the field like a white panthaar...evading all security tacklers and receiving generous admiration from the crowd and viewers alike. Go Cheeves!